The Brooklyn Museum will be free on Nov. 12 and 13 “as people search for a sense of national unity" post-election, the museum said in a statement. PROSPECT HEIGHTS — For the first weekend after the election, the Brooklyn Museum will be free and open to the public, the museum said. 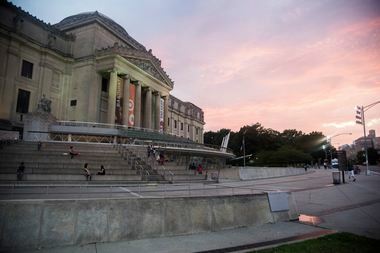 The Eastern Parkway institution will waive its usual $16 suggested donation at the door “as people search for a sense of national unity,” the museum said in a statement on Thursday. In particular, the museum is encouraging visitors to see its new American Art galleries “which embrace an inclusive view of history and recognize the shifting demographics of our richly diverse country,” the staff said. Currently, the museum is in the midst of two special exhibits: "A Year of Yes," a more than year-long exhibit of feminist artwork, and "Who Shot Sports," a history of sports photography that opened this summer. All costs for special exhibits, including "Sports," will be waived for the free weekend, staff at the museum said. In addition, the museum will host a separately ticketed yoga workshop in its Beaux Arts Court and the 10th annual Brooklyn Children’s Book Fair that runs from 12 to 4 p.m. in the Rubin Pavillion on Saturday. Gallery tours will be held every hour throughout the weekends. And on Sunday at 3 p.m., students from Park Slope will host a read-a-thon at the museum to raise money for the Malala Fund.